Madina Script is a fun yet elegant script font with tons of energy, allowing you to create beautiful hand-made typography in an instant. With elaborate swirls, loops, and swooshes (technical terms! 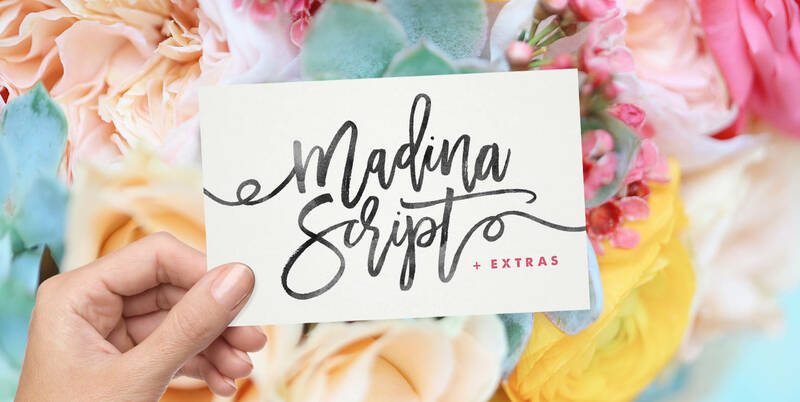 ), Madina Script is guaranteed to make your text stand out – perfect for logos, printed quotes, invitations, cards, product packaging, headers and whatever your imagination holds. What's really awesome is that the font comes with a complete set of lowercase alternates, which allows you to create even more authentic custom-feel text. These alternates are accessible via any software with a glyphs panel, e.g. Adobe Illustrator, Photoshop CC, Inkscape. Try switching between the regular and alternate characters to get the best layout for your text. Another great feature is the bonus ornaments font. This includes 30 hand-drawn elements, including end-swashes for first and last letters, olive branches and flourishes. Please note that not all end-swashes perfectly fit every letter when first typed, but a little position-tweaking should allow you to create some awesome styles to your Script text with this ornament pack. Madina Script (Madina Script.ttf) is a set of upper & lowercase cursive characters which includes a large range of punctuation glyphs, numerals, and multilingual support. A full set of stylistic alternates for lowercase characters are also available. Madina Ornaments (Madina Ornaments.ttf) is a set of 30 hand-drawn end-swashes, flourishes and floral elements.